Remember Rick Springfield’s “Jessie’s Girl“? But, I will keep loving him with my tastebuds, I just know it! But, I will settle for some Lactose-FREE cheesecake instead of that! In case y’all missed it, this happens to be my birthday week and no birthday week is ever quite complete without cake – or cheesecake – or more likely, dairy free – cheese-like cake – for lactose-intolerant ‘ol me! The idea for this cake happened when my daughter and I stumbled into these Glutino cookies on one of our shopping expeditions (Glutino did not compensate me in any way or form for my new addiction to their cookies). We brought them home and suddenly I started craving “cheese”cake!!! Why – well, clearly I have issues!!! I was all out of navy beans to make these bean-“cheese”cakes, but I had some soaked cashews in the fridge and after seeing numerous cashew cakes on the interwebs I figured I would take a stab at my own version. …and bout 4 hours later…. Voila – this Dairy Free, No Bake, Totally Cool, Chocolate Cashew Cake adorned my kitchen counter – but not for too long!!! 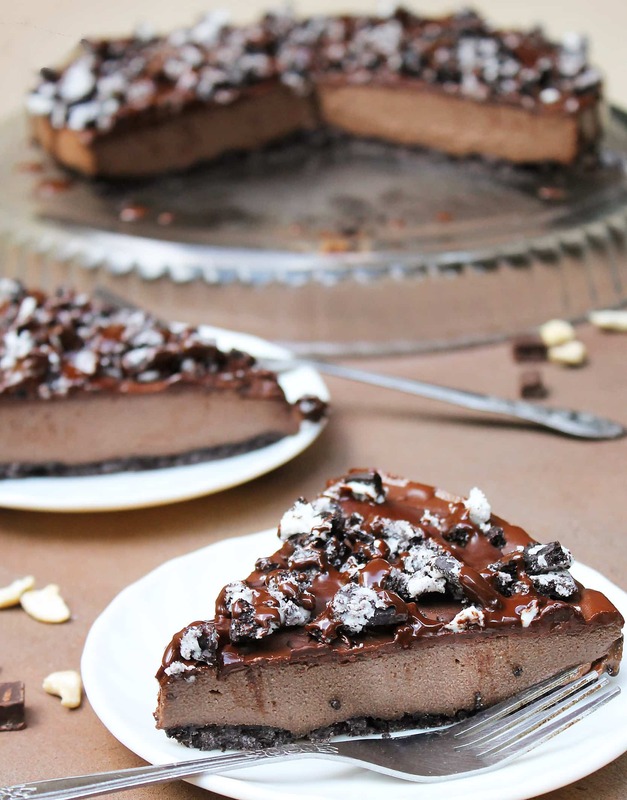 This cashew “cheese”cake isn’t exactly like it’s dairy filled counterpart, but if you (like me) have un-requited love issues with lactose – then this Dairy Free, No Bake, Totally Cool, Chocolate Cashew Cake will fill the void, nurse a craving away and will not cause a mini-earthquake in your belly in the process! Speaking of love and gluten and dairy free – please don’t forget to enter the giveaway for these totally -AH-Maing AMRAP Bars-here! Thank You Amanda @ Running With Spoons for giving me the chance to indulge in some thinking out loud this Birthday-week Thursday! Please check out her space for other random musings! Let it hang out in the fridge for a few minutes to an hour before cutting into. That’s one beauty of a birthday cake. Happy Birthday! all week long! Thanks so very much Maureen! Oh my laws- this looks so divine Shashi…can you bake my birthday cake please??? Cheesecake is a favroite around here too :). And clearly you’re not just a masterchef- hello, POET :)! Yes! 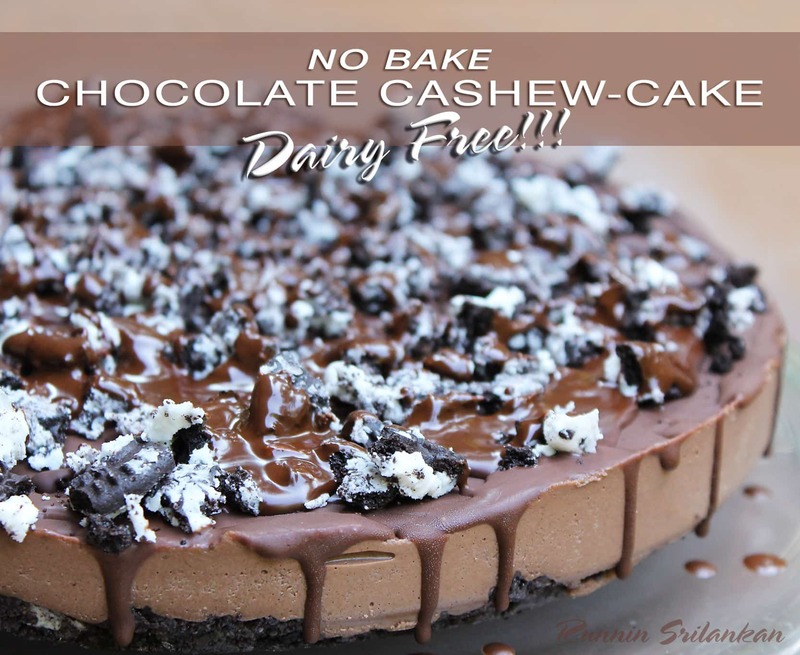 I can do that – better yet – this is no bake and cashew”cheese” cake! Woohoo! Hope your weekend is wonderful Khushboo! First of all HAPPY BIRTHDAY pretty lady! Aww-Taylor you are the sweetest – thank you my dear friend! Those Glutino cookies are surprisingly good! My daughter said that they are better than oreos! Happy birthday Shashi! This cheesecake looks fabulous! You’re so creative in the kitchen. Thanks so much Melanie! Hope you have a wonderful weekend! Thanks so much lovely lady! I love ‘cashew cheese’! Your ‘cheese’ cake looks really smooth and gorgeous, Shashi. Mouthwatering, stunning, spectacular… I can’t stop look at this cake! If I don’t eat some chocolate in the next few minutes I’ll go crazy! By the way, belated happy birthday! Haha – I hope you got your hands on some chocolate Daniela! Thanks so much! Happy [belated] birthday! This looks amazing!! HAPPY BIRTHDAY SHASHI!!!!! What a way to celebrate with a cake like that. Looks scrumptious! Hope you have a blast, all week long! Thanks so much Mike!!! I need some of your cauliflower bagels to balance out all this chocolate! Hope you have a wonderful weekend my friend! Happy, Happy Birthday Ashley! Hope you get to take a break from all your running around to enjoy a little time to celebrate you! Virgos do ROCK!!! Happy Birthday Shashi! This cake looks amazing. I’m not lactose intolerant but plan to go vegan for this month and this cake would make it so easy to skip dairy!! Happy Birthday to you!! That is one beautiful and delicious cake. Perfect GF,LF and it’s TD (totally divine!! Haha – “TD” – I love that!!! Thanks so so very much Suzanne! LOL that song 🙂 and dont mind me, just sitting here literally salivating over that cake that promises to not give me any lactose-induced stomach issues. is it possible to swoon over cake, bc thats whats happening here.. Thanks so very much Kelly! Hope you have a wonderful weekend! Looks like a delightful and guilt free treat. No worries-I’ve done that a bunch of times myself! Thanks so very much, btw. Wow no bake?! And my buddy Tyler would love this because he’s sensitive to dairy. Awesome! Gonna let him know about this!! Thanks Chris! I am big time “sensitive” too – and this cashew cake was a tad bit better than the navy bean one I made before. It looks divine! A fantastic dessert. Oh my gosh hahah that song fits perfectly. This cake looks divine and your photos are GORGEOUS. Happy birthday week!! 🙂 Thanks so very much Erin! 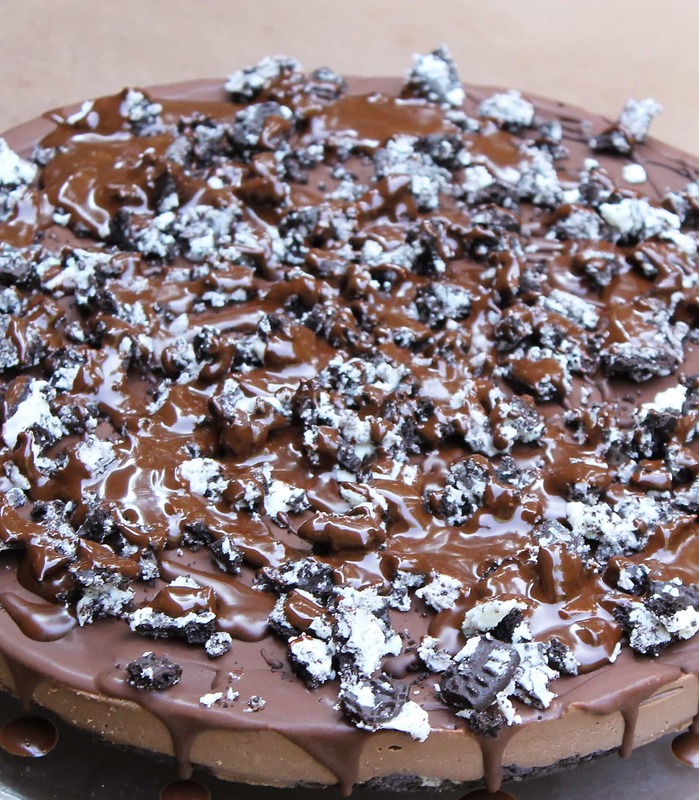 This is one crazy chocolatey cake! Totally birthday worthy. Hope you have a great birthday love!! Thanks so much Joanne – hope you have a hassle free move! Happy birthday week – I hope that it is been full of fun and friends!!! 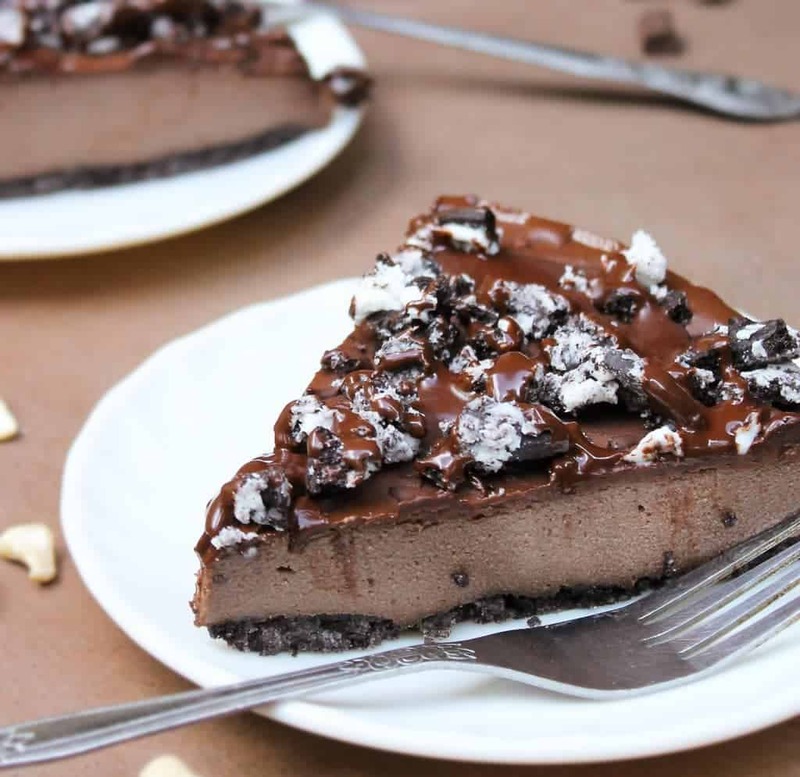 That cake looks amazing – the no bake part is my favorite!!! Cashew cream never looked so good! You fill the blanks. I legit have no words. Okay – so I got words – how bout you overnight me some of those Lindt truffles of yours – they look and sound insanely delish!!!! Thanks so much Kumar’s Kitchen! you can definitely have your cake and eat it too with this! YUM! we love glutino and love the lactose free version. Happy bday! Thanks Lindsay! Glutino cookies are dabomb! Love this recipe and love post in general. Happy Birthday!!!! Thanks so very much Sheryl! Happy B’day to you,loved the cute lil poem :)Cake looks ravishing,is there a susbstitute for coconut oil or will it leave a significant flavor in the cake? Thank you Harini! No, the coconut oil did not overpower the cake, there was no strong coconut taste at all – but, the coconut oil plays a big part in helping the cashew cream set and harden ever so slightly so it’s not like a puree.If you left it out,you might have to use something else to help the cake set – I haven’t tried any other options so far…hope this helps. Happy happy birthday week friend!! And what an awesome cake to celebrate – this looks delicious and I’m not even lactose intolerant! Haha – thanks so much Ashley! Ha! Ain’t that the truth! Thanks so much Erin! OMG!!!! Why, why, why did you have to post this when I’m dieting? haha 😉 Happy belated birthday! Oh dang – well – save this for when you are not…but don’t ask me to save you a piece – this cake barely lasted 2 days in our fridge let along 2 weeks! BTW, thanks so much Tara and good luck with your weight cutting! Thanks so very much Charlie – unfortunately, I over compensated for the :healthier” nature of this cake and ate way too much! Belated Happpyyyyyy Birthday Week to you too!!! Happy Birthday! What a great cake to celebrate your birthday with! !